Oh too funny!!! Ms Magtree has once again made me spill my morning tea laughing. Where on earth…? Barbara, it’s right around the corner from Clark Kent Drive, of course! Yes! You know it! Very near It’s A Bird It’s A Plane Crescent. Oh god, both my hubby and I laughed our heads off on this one Carin. What a morning delight! The image of you and your husband suddenly headless there in the almost-desert, well, it’s worth having to stop my car, turn around, and go back for this shot. One of those cases where you drive by and think… yes? no? nah…. Then when you’ve driven sufficiently far enough away that it’s a bit of a nuisance to go back, you realize you must. Anyway, you’ve made my day! Oh my gawd … laughing out loud ’til I choke, Carin. 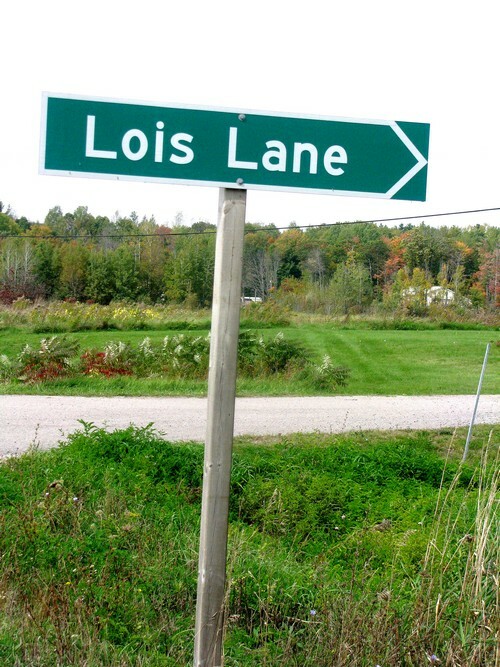 Where ever did you find Lois Lane? And, you drove it, right … all the way to Clark Kent Cresc? Someone needs to install a phone booth there.